There are numerous applications that can be taken with this text. Beginning with just one . . . our attitude and perspective on Sunday worship. Is it a blessing or an obligation? The evil one wants us to find reasons why time for church time is just too difficult. He wants to drive a wedge between us and God’s teachers simply because the teacher doesn’t always do things or say things in the way that we want him too. The devil wants us to make worship all about me and what I want. The more the devil wins the more we miss out on the true joy of worshiping our God, seeing what Jesus has done for us and having our hearts and our minds renewed with hope and comfort. Worship does have a very personal component. Worship shows us the special relationship we have with our God. That relationship starts with the love that God has for us and ends with the blessings that come through Jesus. We have reason for joy, not because we are so good, but because we are forgiven freely through Jesus. We have reason for joy because we do not live in fear of death, but we live anticipating the eternal joy of heaven which Christ won for us. These are reasons to be joyful and to worship our loving God. True worship always centers on what God has done for us through Jesus. As we think on that, the Holy Spirit builds us up in faith and the response of praise and thanks naturally flows from us. May we always continue to worship in a way that brings him the praise, honor and thanks he deserves. Lord Jesus Christ, your life and death was for me. Because of your gift, I can be set free from sin. Because of your gift, I am given the opportunity to know eternal life. Keep that in the forefront of my eyes so that my worship time with you is focused on giving thanks for all that you do in my life. 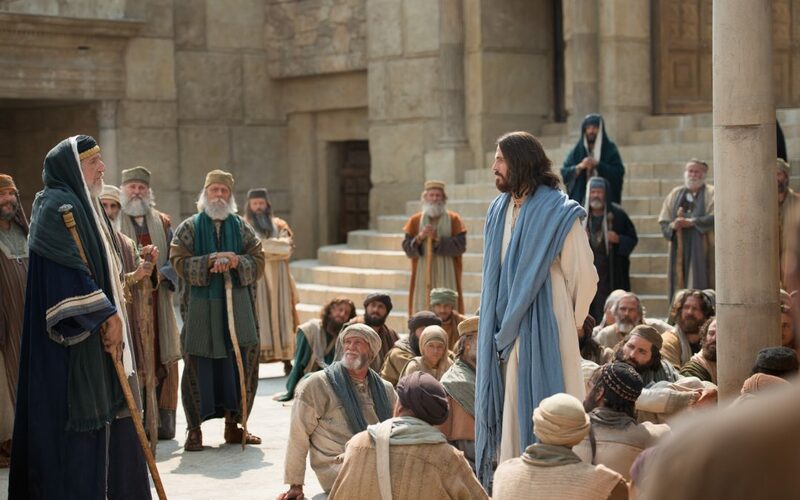 Christ wants from the Pharisees nothing less than an act of faith in his own divine person. His heart longs to save them. Christ yearns to bring to salvation everyone he encounters, including his enemies. Does my own zeal for souls bring me to reflect something of Christ’s courage and love when I am faced with opposition? Do I desire and seek what is good for everyone regardless of their attitude towards me? ← The Picture Card Jesus ?